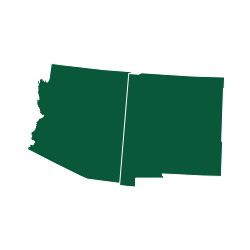 From the North: Driving from Albuquerque or Farmington, NM, drive on Highway 550, exit to County Road (CR)7900 at mile marker 112; drive CR 7900 then turn westbound to CR 7950 which will turn into a dirt road after three miles. 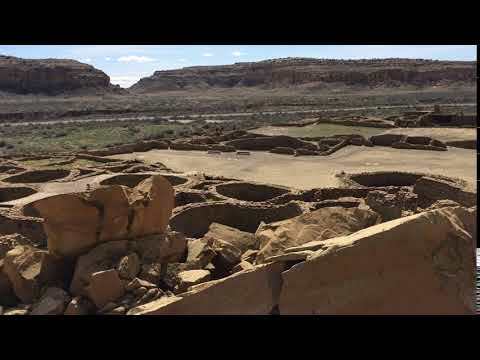 Drive 13 miles of dirt road to reach Chaco Culture NHP. From the South: Exit Highway 9 to State Road 57. State Road 57 is a rough dirt road for about 20 miles before reaching Chaco Culture NHP. South entrance is not recommended during inclement weather. Gallo Campground is the only campground in Chaco Canyon National Park so reserving ahead of time or getting there earlier in the day depending on the season are very important. The park is very remote so it's a long drive on a potentially very rough road to get in but once you're there the route is well worth the visit. There is currently no potable water at the campground but water is available at the Visitors Center a short drive down the road. There are however flushing toilets and running water in the bathrooms. The campsites each have a picnic table and fire pit. I thought the set up of the tent only area was interesting. There is a parking lot area with sites surrounding it on three sides. The set up allows for privacy between the sites which are nestled in among the rocks and plants as well as ruins! The campsites here are incredible! They are peaceful and tucked under an amazing starry sky. The ruins are unlike any other; visitors walk through the rooms sculpted by the puebloans a whole millienium earlier. Gallo is a great car campground that still feels remote and tucked away from the world. Park is accessed from 17 miles of passable dirt road. Driver beware: wet conditions may make muddy roads temporarily impassible by cars not up to the task—call ahead if concerned. Flush toilets are available in campground, but there are no showers or other amenities. There is drinking water by the visitor center, which is only another short drive down the road. Bring all food and supplies because there are no supplies available within 40 minutes of the park and that is at a gas station. Note about the few secluded tent only sites (sites 41-49): these sites do not allow you to park directly beside the site. You must walk your gear a short+ distance to a defined tent pad (mind the sizes when you reserve). Also, the way the wind blows through the canyon, sites 46-49 have no wind break, and fires may become too dangerous to light up. We camped in one of these and loved our experience. They have more space, are more private, and quieter. But setting up camp was more of a workout too! Nice open campground next to ancient cliff dwellings. Excellent night sky with a night sky program on the weekends. Gets very cold at night at this location. Campground is tough to get to and requires at least 13+ miles of unpaved road travel, however, a car can make it. Check with the Rangers first before coming to ask which roads are open and accessible. Don't follow the directions on your gps, they specifically have warnings against it on their park website.